Charming A Frame on Two Wooded Acres with Hot Tub! 1/35: We hope to have you visit soon. 2/35: Come on in and relax. 5/35: Stream your favorites please use your own login. 12/35: Sit together and enjoy. 14/35: Main level, full bath. 15/35: Upstairs Bedroom One. Queen Bed. 17/35: Upstairs Bedroom Two. Queen Bed. 21/35: Futon lays into double bed. 22/35: And a twin bed in the secret lair as well. 24/35: Relax in either of the soaking tubs. 25/35: Enjoy a meal outdoors in the summer. Property Size 1,840 sq. ft. Step inside this charming A frame cabin in Camp Connell and find many modern luxuries. This cabin is so much more than it seems! Room to stretch for up to 9 guests. Three levels of living space beginning on the middle floor. Enter to find an open and airy living room, large flat screen TV, sofa, dining room with picnic bench seating, gently flow into the well stocked kitchen. Two bedrooms upstairs each boasting a cozy Queen size bed and plenty of dresser and closet space. Heading down the staircase off of the kitchen you'll find a secret lair, a perfect room for the kids in your group. Twin bed, Futon and air mattress downstairs. Exit through the sliding glass door off the kitchen to an expansive patio with gas BBQ grill. Sip your coffee or enjoy a summer supper out on the patio looking over approximately two wooded acres. 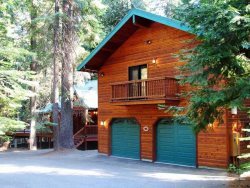 Finish a hike at nearby Big Trees State Park and soak in the hot tub in the front yard! This home sits peacefully on two wooded acres, backing to National Forest land. Privacy abounds at the Under The Trees Cabin. The Under the Trees Cabin offers year round comforts such as central heating and woodstove for chilly winter nights, plus a high quality GENERAC back up power generator, should the power go out! Instant hot water heater provides an excellent source of relaxation when you choose to enjoy a bath in either of the full baths with soaking tubs. In the summer months enjoy your favorite BBQ dinner on the gas grill. Stream your favorite shows on the Apple TV in the living room. Please utilize your own account log in. High Speed Wireless Internet is available, as well as a landline phone. In the winter months take a leisurely drive up Highway Four to Bear Valley Ski Resort for epic snow sports. Enjoy Snowshoeing and Cross Country skiing in Bear Valley Village, or hit the slopes at the Resort with your skis or board. Bring a sled or inter tube up and make a sled run in the backyard! Escape the busy day to day life and find true peace, privacy and recreation at the Under The Trees Cabin! See you soon! Other Amenities: Wifi, Landline Phone, Apple TV (Streaming Apps such as Netflix, Amazon etc. *Guests use their own login information, keyless entry, soaking tub, plates, silverware, cookware, pots and pans, bowls, glasses, pillows, throw blankets and pillows, games and puzzles.